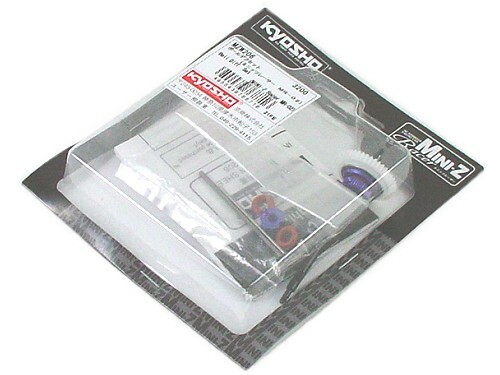 Kyosho Mini-Z Ball Differential Set for MR-015/MR-02/MR-03. Points Earn 32 points when you buy this product! First I would like to say that I have used several different MFG of ball diffs, and I have these Kyosho Ball Diffs in everyone one of My MR-02's now. Fist thing to note it that they are the smoothest ball diff out there. They are also very maintance free, basically all you need to do is clean them every now and and again and just brush them off as needed to keep clean. They also hold their adjustment well. With the other ones I had I was always adjusting them because the adjustment would change over time. These ones have been fabulous at staying were it is set. In my opinion I this is the absolute best ball diff on the market, period. 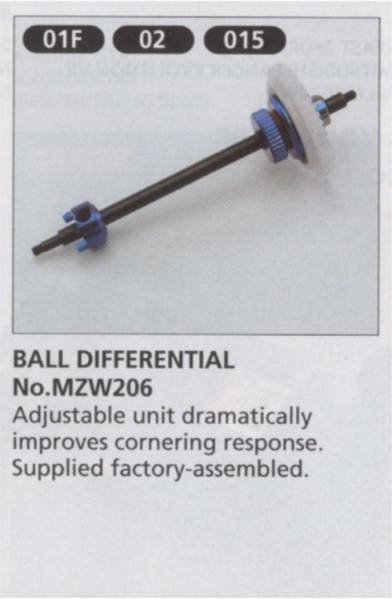 As mentioned above, the Kyosho ball diff is definitely the smoothest one from the factory. It's overgreased compared to some others, and a little stiff out of the box, but once broken in (two runs or so) it's buttery smooth. Very consistent action and a relatively large range of adjustment -- some other diffs lock up prematurely or lose power if they're too loose, but not this one. Very impressive. The downside, however, is weight. The Kyosho diff, does not come with a titanium shaft, so if you're a particularly sensitive or weight-conscious Mini-Z driver, you'll have to spend a bit more to buy a Ti-shaft for this diff. Aside from those two, Kyosho thoughtfully includes spare parts and tools for the differential, something that other manufacturers don't bother with. The spare O-rings are especially important as they do wear out over time and it's nice that you already have two spares in the package to use. Overall, a bit on the expensive side, but a well put-together package and worth the money for the smoothness alone.